We are here in the world of Birkeland who also largely observed this configuration, and wrote several scientific papers. Unfortunately, Birkeland has not given the correct interpretation: he claimed to have demonstrated the origin of the rings of Saturn. The astronomers argued against this interpretation, arguing that Saturn does not produce electricity, and that the rings had been clearly identified as rocks and ice. But K. Birkeland refused this vision of things. He concluded that most of the cosmic machinery was made of electric and magnetic interactions in ionized gas, that is called a "plasma". In this deduction, he was actually close to reality but this was realized only at the end of the twentieth century. He was so sure of his interpretation that he called his last and biggest Terrella he built "The Universe". But let’s go back to the configuration of Birkeland’s Terrella. The sphere – now a star - sends electrons over its entire surface. But the magnetic field turns them down toward the equator, perpendicularly to the magnetic axis of the star. A ring current shows up, very intense around the sphere. The pressure inside the chamber can change (from ten to hundred Pascal). The influence of the electric intensity is low: from 300 V and up to 3000 V, we see little influence. It’s still Gronoff Guillaume, who observed and photographed the largest number of different cases. He patiently retrieved all of K. Birkeland’s observations, and several others that had not been described by Birkeland. When the pressure is of the order of hundred Pascal, we observe a Bright purple and redish émission. These colors tell us what gas was excited (nitrogenize molecular and nitrogenizes molecular ionized), and in what excitation state. But if pressure decreases, the radiation is becoming more and more pale and turns to a milky white. These colors are also visible in the most intense polar aurora. 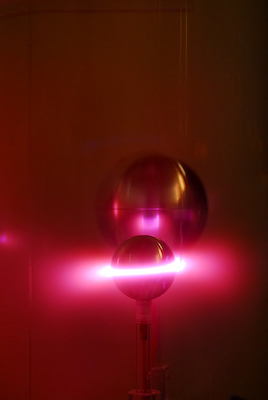 The electrons are shot by the sphere, on its surface. They are folded along the magnetic equator where they are forced to turn, trapped by the magnetic forces. But there is also an electric field between the sphere and the duct. This field exists simply because the sphere is connected to the minus pole of the generator while the duct is connected to the plus pole. During the rotation in the stellar ring current, the electrons hit the gas, which is the highly rarefied air. These collisions excite and ionize the gas, a mixture of nitrogen and oxygen. Returning to the ground state, the air releases its energy as light visible with the Planeterrella. But sooner or later, the electrons undergo a collision that will divert them to the duct, attracted by the electric field. An interesting phenomenon deserves attention: the internal edge of the ring current is not alongside the sphere, but one or two millimeters off. Between the sphere and the ring, there is a narrow zone without light emission. What happens? 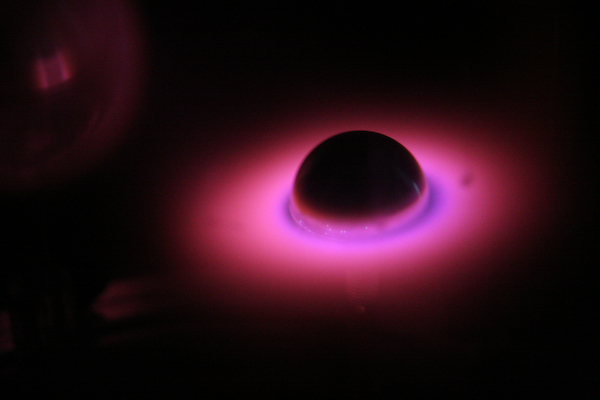 The air inside the chamber is a plasma : it is mainly composed of neutral gas, the one we breathe, although very rarefied. But the electrons ionize a portion of the gas through collisions. Thus, the gas also contains free ions and electrons. The ions are attracted by the sphere, because the sphere is negatively charged: as with magnets, the minus and the plus electric charges attract each other. The ions create an envelope around the sphere. _ This is called the "Debye sphere" named from Peter Joseph William Debye (1884 - 1966), a Dutch physicist and chemist who discovered the phenomenon. Debye won the Nobel Prize in 1936. Calculating the thickness of the sphere (the Debye length) gives 1.8 mm, consistent with the observation.